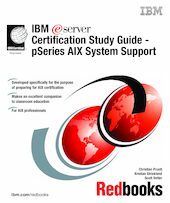 This IBM Redbooks publication is designed as a study guide for professionals wishing to prepare for the certification exam to achieve: IBM eServer Certified Specialist - pSeries AIX System Support. The system support certification validates a broad scope of AIX problem determination and resolution skills and the ability to perform general AIX software system maintenance. This book helps AIX support professionals seeking a comprehensive and task-oriented guide for developing the knowledge and skills required for the certification. It is designed to provide a combination of theory and practical experience needed for a general understanding of the subject matter. It also provides sample questions that will help in the evaluation of personal progress and provide familiarity with the types of questions that will be encountered in the exam. This book does not replace practical experience you should have, but is an effective tool that, when combined with education activities and experience, should prove to be a very useful preparation guide for the exam. Due to the practical nature of the certification content, this publication can also be used as a desk-side reference. So, whether you are planning to take the pSeries AIX System Support certification exam, or if you just want to validate your AIX system support skills, this book is for you.